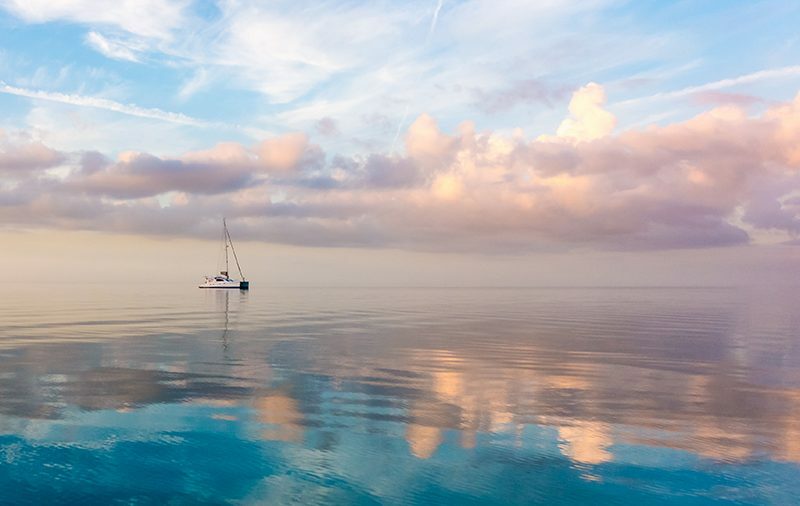 Downwind sailing is by far the most relaxing experience we could hope for while cruising, yet somehow it seems we’re always beating upwind in the Bahamas…but not this time! 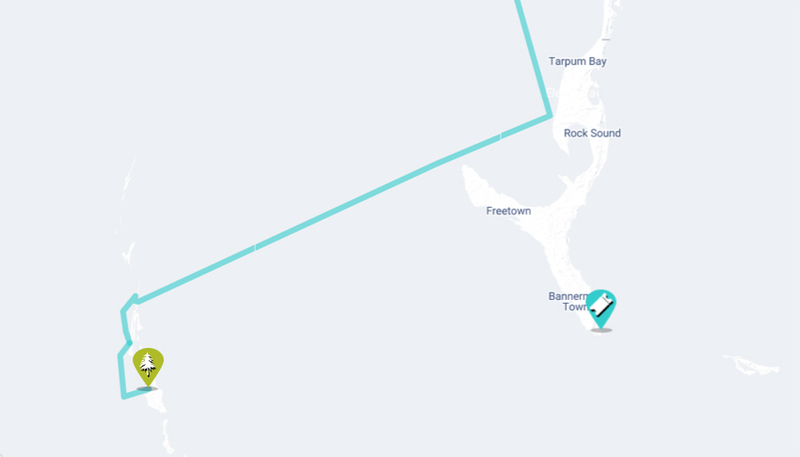 We launched off Eleuthera Island from Kemp’s Point, through Davis Channel and into the 5000+ foot deep blue ocean on our way to the Exuma Islands. 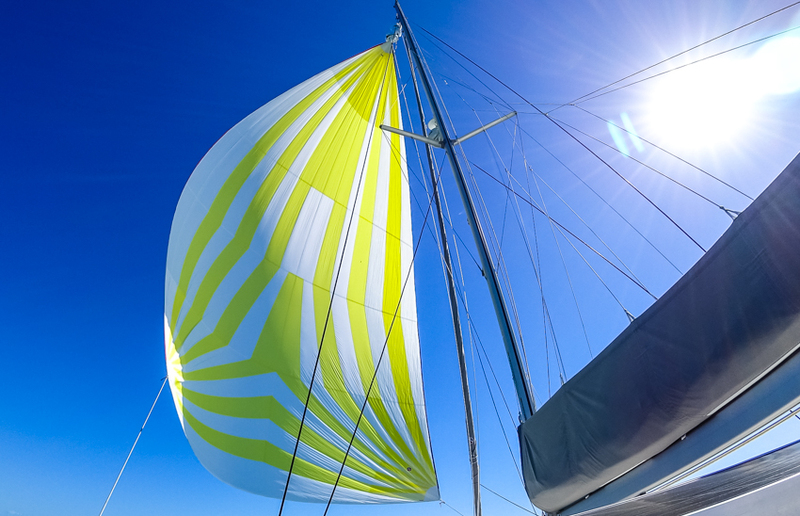 The winds were lite, almost behind us at 160° and we proudly flew our beautiful-bright-yellow-and-white asymmetrical spinnaker. Life is good! 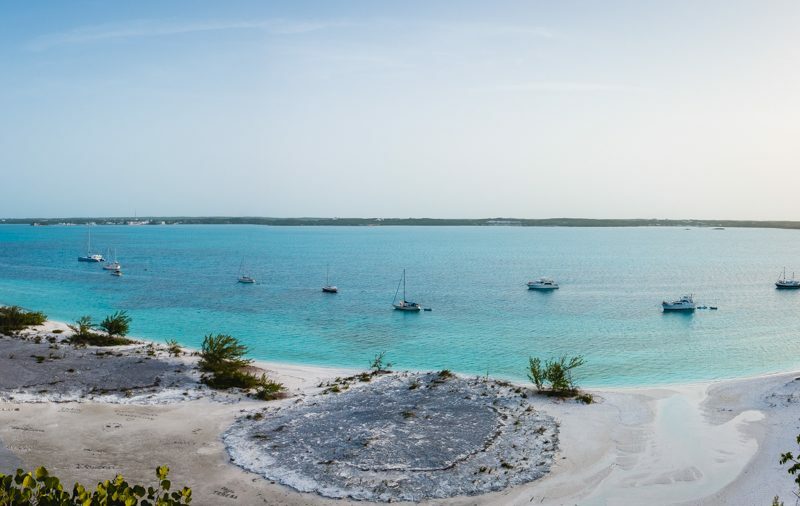 We have two big goals while we’re in the Northern part of the Exumas, spear some fish or lobster cause we’re completely out of protein here on Curiosity, and see what the fuss is all about in the protected Exuma Land and Sea Park. I think it’s awesome there’s a whole cluster of islands way out here in the Bahamas that are set aside as a national park. There’s something extra special about exploring protected areas. In the Land and Sea Park it seems even the wildlife knows they are to be left alone. Can you believe how close we were to that sea turtle, eagle ray and shark? Makes me want to buy an even better underwater camera. But I’ll have to wait on that, we’ve got a drone to replace first. Here’s the scoop from our first few days in the Exumas. 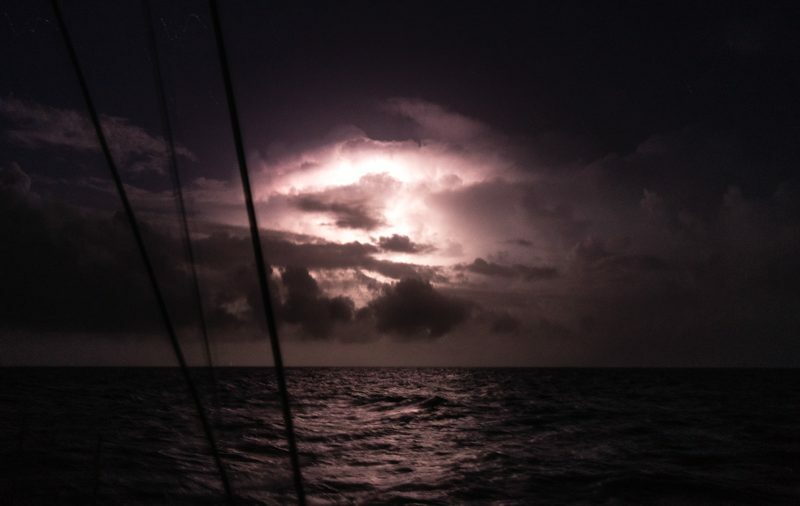 This was our first stop in the Exumas and we anchored at Long Cay for a 30+ knot blow shifting E to NE. It wasn’t perfect but we needed a place that was quick and easy to get to after crossing from the Eleuthera Islands. The tides really rip here, meaning the current will sometimes overpower the wind or the wind will put you at an angle where the incoming and outgoing tides slap the side of the boat which makes for a loud and rolly night of sleep. It’s okay though, we were on a mission: To get lobster before heading into the Land and Sea park where it’s illegal to spear or fish. Funny enough we saw some promising rocks nearby Lobster Cay and we caught 3 of the largest lobster we’ve seen in the Bahamas! It was a ton of work fighting the current but the exercise was great and the extra protein was welcome and should cover us for the next week. There are some fascinating coral formations (and plenty of fish too) on the East side of Long Cay that we lucked upon near slack tide. Elk Horn coral which is said to be one of the most important in Caribbean reef growth along with Stag Horn, Pillar, Brain and other Diploria and Acropora corals. We came to spear but we ended up snorkeling for an hour until we nearly became underwater popsicle! 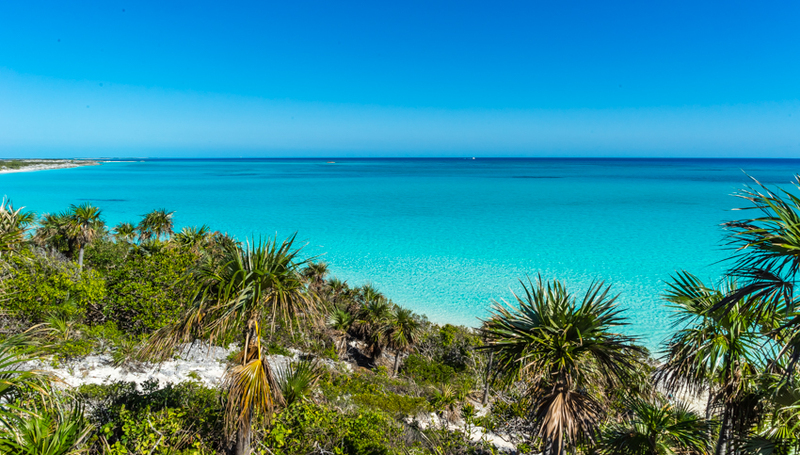 Because of the unfavorable winds, we couldn’t make it to the famous Allen’s Cay (aka Iguana Island) to see the endangered Bahamas Iguana, but it gives us a reason to come back. 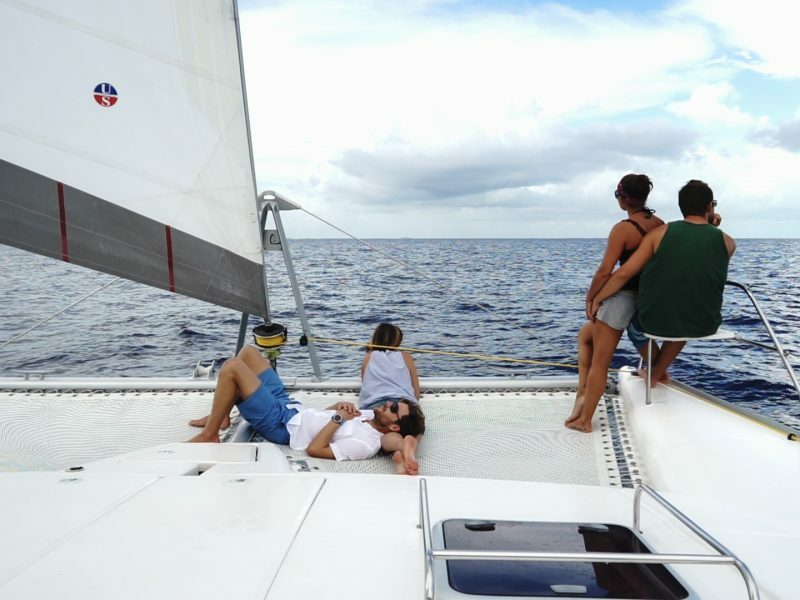 With another blow on our heels we set sail south towards the Exuma Land and Sea Park. We considered heading into Norman’s pond, which is famous for drug smuggling, but the entry is shallow and we assumed the pond would be full of boats considering it’s the best hurricane hole in the area. 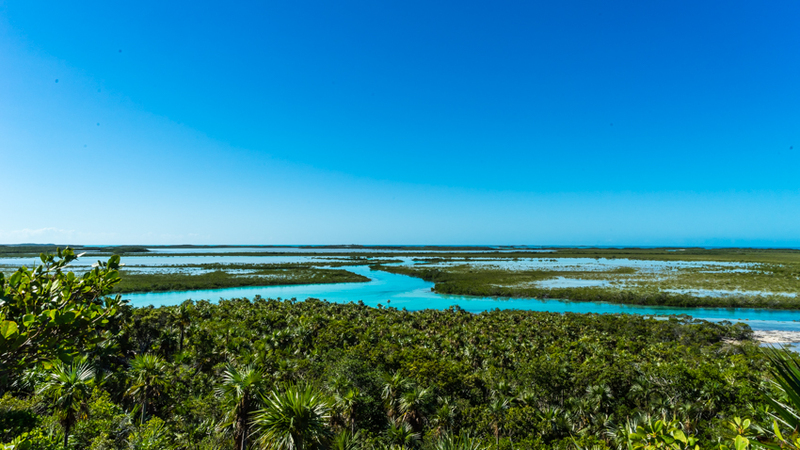 Shroud Cay is the first protected spot inside the National Park and we tucked into the North Anchorage, which put us conveniently near several coral heads and the creek inlet into Driftwood Camp. The water here is 5 feet a low tide and unbelievably clear. There’s one clip in the video at 1:29 where Nikki’s jumping into the water and it simply blows me away every time I watch it: You see sky, she looks down at the water, but as she jumps in there’s no splash and there’s no wavy water effect on the lens. It’s just as crystal clear in the water as it is on top of it…it’s not until she looks back towards the dinghy that you realize she’s underwater. I think that’s pretty amazing. 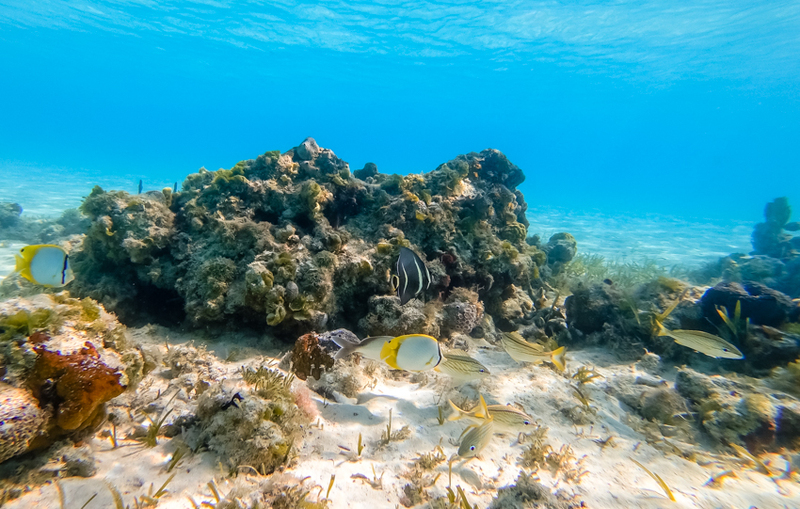 The snorkeling around the area was lackluster as far as coral formations and colorful fish, especially in comparison to what we discovered at Lobster Cay. 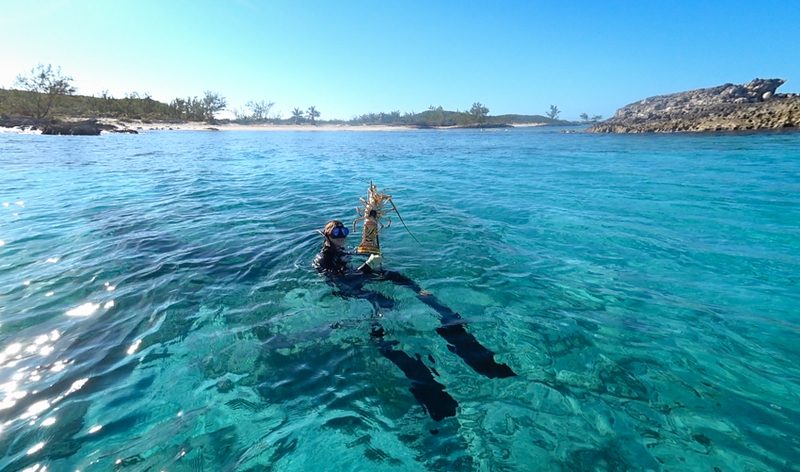 We took the dingy all around the west side of Shroud Cay but didn’t spot much underwater life. The real gem from our experience is the creek to Driftwood beach. If you enter the creek two hours before high tide, you’ll be able to lightly paddle through and really take in the scenery. The turtles, sharks and rays weren’t the least bit bothered with us paddling around while they cruised the creek. There is no driftwood on the beach and the driftwood cabin has been removed. The junk people leave as mementos is removed by the park service, so the name is deceiving. What you will find is amazingly soft sand and a short hike up a hill for a great view of the creek and anchorage. And let’s not forget the gorgeous sandbar beach that seems to extend for miles towards the Atlantic Ocean. We could have spent another couple of days hanging on the beach and paddling the creeks but another blow is on the way so Mother Nature says it’s time to move on! It’s all good, our next stop is Warderick Wells and it’s supposed to be even more spectacular (if you can believe it). Anchorages: We stayed one night at Spanish Wells South: Roomy anchorage and a quick dinghy ride into town for fuel and supplies. The grocery store further into town is much better than the one by the fuel dock. Glass Window Bridge: Another roomy anchorage with easy land access from the beach. Both anchorages can be found easily on Active Captain. Cell & WiFi: Our BTC signal was non existent without our booster on. Always exciting to go from no service to a downloading emails with the switch of button! Thanks for being a part of our journey! If you enjoy what we do and you want to help us keep the videos and posts flowing, check out our Say Thanks page. It lists out some ways you can show us some digital love and most won’t cost you a penny. Absolutely gorgeous water and scenery! One wants to just stop and drink it in for hours. Thanks so much. Your videos are so professional that it makes it hard to watch anyone else’s videos! 🙂 So beautiful! Hi! I saw in this clip and you were sitting on these cool turquoise seat backs on the trampoline. Where did you get those? Loving the videos. It has been so wonderful to watch you two become comfortable in your sailing! We have not shared these chairs due to the poor quality. They are not made to last, especially in marine environments. We’re looking for replacements now from a company called Sport-a-Seat and once we have a good one to recommend we’ll share all the details! I’ve been watching your journey since your Alaska trip. My wife and I are full time in our MH with our tabby “MoMo” he rules our life also. Keep up the good life and looking forward to your new adventure!! Thanks guys, tell MoMo hello. You two are a hoot! A question for you about the helm tech. You’ve mentioned a couple times on video and in the blog about some of the wonky electronics (cutting in and out, failing). What’s the state of things? Curiosity’s headed back to Just Cats for some more service. Stay tuned! Fantastic! But seriously, the sharks freak me out! That sand! That looks amazing! The super clear water! The lobster! The other fish (mackerel, did you say? )… Yay! And, the turtle! I love that turtle! it is nerve racking to me ?! Nikki is that a new highlights ? Been to Exumas several times on our 40 Ft Caliber. Highborne to Great Exuma awesome. Enjoy Wardwick Wells with BoBo Hill, the Pirates Laird, the once a week get together for drinks on the Park Rangers deck with everyone, etc.and Staniel with the Pigs and Thunderball Grotto, to mention only a few. It is a wonderful group of islands. Enjoy!! Excellent videos of underwater. Thanks for sharing as I’m not the swimming underwater type. Glad you are both having a wonderful time on the water. Always look forward to your videos and thanks for for putting a music credit up. I have enjoyed your choices. Happy Sailing – Beth from Oregon! Great production, love the Kite – but that’s the sailor in me. We love that spinnaker. Just puts a smile on our face looking at it! Hey Scott, we haven’t shared the chairs yet because they have started to rust a bit on the inside. We’re looking into higher quality chairs before we put our ‘seal of approval’ on them and add them to our store. If you’re not using them in a saltwater environment let me know, I can try to get you a link. Another Beautiful video but oh so close to sharky. Love the spin on who made you late. Happy Sailing! Clearly beautiful salt water. A dream come true. Only a very, very small percentage of all the people who ever lived on earth have walked and swam in such clearly beautiful salt water. I love that both of you seem to appreciate what a special thing it is to do. We often have to pinch ourselves because the beauty around us is too intense. One might think it gets old, or common, but clear blue water is gorgeous. Geesh! That is beautiful turquoise water! I could feel the sand between my toes! The turtle was awesome- it was as if he was leading to your anchorage! Love following your adventures! I have 10 minutes of video of that turtle and I wanted to include every minute of it. Something about watching those guys is memorizing. Another beautiful video by you two. Nikki, love your big floppy hat, always good to keep,a,floppy hat I think. Its not great on a windy day but other than that I love it. It’s packable too so I can roll it up and tuck it away if need be. Yes, always good to keep a floppy hat! Beautiful to watch on a rainy Easter Day here in Ky. Will put this on our bucket list as gorgeous water. Will you be coming back to Florida in 2017? We are coming back to FL in May for a bit of service. This is just unbelievable beautiful place! Reminds me of our time in Hawaii when I thought I lost my child…she was snorkeling and I lost track of her…so I jumped in and swam out….came up for air and looked to the left of me and like 5 inches from me was this huge head, bigger than mine, it was a turtle and right behind it was my child…..the turtle was bigger than her….I said what did I say about going out far? She then says I was just playing with my friend…little did I know the whole time, about 8 months she had been hanging out with this so called turtle friend….we took our kids over to Kona to live a year in paradise….back then it wasn’t a huge tourist area!! I’m with Jason, that water never gets old ever!! Thanks for sharing!! !Happy Easter! Our first adventure with giant turtles was in Kona in the early 2000’s. What a wonderful place to raise a family for a year!